This annual parent-led event provides a wonderful opportunity for us to welcome people into the school and showcase the incredible creative talents of the school community. 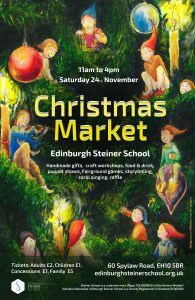 The 2019 Christmas Market will take place on Saturday 23rd November, 11am – 4pm. Join us for a magical day of food, carols, storytelling, beautiful gifts, and lots of twinkling lights. You can keep up to date with the event by following the school FB page. This event is the school’s largest fundraiser, bringing in over 2,000 people trough the gates. The Christmas Market Spending Group, made up of volunteers who meet once a year, are responsible for deciding how the proceeds are invested back into the school. In previous years, these funds have financed a number of projects, including the Kindergarten Water Feature, set of hand bells, digital cameras for school use, gymnastics equipment, a cycle shed and newly paved walkway connecting Craigneen to the rest of the campus. Last year’s most exciting purchase was a pottery kiln for use in the ceramics class. The kiln will be used to create fired glazed pottery and we look forward to seeing some inspirational creations in the near future. If you have an idea for a project, no matter the size, simply obtain an application form from the office, complete the relevant sections on the form and return to the office. The Christmas Market Spending Group will then review the application and decide on the best way to proceed.